The linear theory including the effects of bending-torsion coupling and rotatory inertia is used to derive the equations of motion for a space beam with variable curvature. The governing differential equations of motion are derived based on Euler-Bernoulli beam theory via Hamilton’s principle. The full, coupled system of governing partial differential equations has a total order of 12. Co-Ni-Si additional material on the steel 50Mn7. The ploughshares are tested on the plough roller machine. Researches were perfomed in periods of 120, 240 and 360 hours of ploughing, or 60, 120 and 180 work hours of each ploughshare. After 180 hours of work at least average reduction of the ploughshares lenght was at welded ploughshares and it amounted to 8,27 % of the initial length. At the same time reduced the average length of the top of the ploughshares with standard ploughshares amounted to 19,65 % of the initial length. It was concluded that the application of welded ploughshares can contribute to increased of the productivity. The paper deal with heat pipe technology which is often used in electronic cooling from small voltage microchips to the high voltage electric elements. In case of cooling the high voltage electric elements have to be evaporator part and condenser part of heat pipe a separated by electrical nonconductive material, because the heat pipes are most often made of metallic materials, and thus, are electrically conductive. As a working fluids in this applications are used dielectric fluids such as fluorinert liquids. But there is still risk of the dielectric breakdown between evaporator and condenser of heat pipe. The task of the experiment is to find how the ambient temperature effect on dielectric breakdown of vapour phase of working fluid in heat pipe. In experiment was investigated dielectric breakdown between copper pipes inserted in to glass heat pipe in distance of 70 and 65 mm and temperature range -10 to -40°C. This distance simulate electric insulator distance of heat pipe used for real application of high voltage electric element cooling. For this experiment was used glass heat pipe with working fluid Fluorinert FC 72. The choice of this fluid is mainly due its excellent dielectric properties and unique combination of the thermodynamic and others properties, which makes the Fluorinert FC – 72 ideal fluid for electronic cooling used in many electronic applications. Pipe from the boiler of thermo power plant with diameter φ45was ruptured in exploitation conditions. In order to determine the reasons for this accident, very complex investigations of the pipe were performed. As first chemical composition was determined. Ovality and visual inspection of pipe were performed. Mechanical testing include tensile test at ambient and increased temperature of 350 0C. Thickness measurement of the wall pipe was made too. As technological testing flattening test of pipe segments was done. Metallographic investigations consist of determination of non-metallic inclusions, analyse of microstructure and grain size determination. Performed investigations didn’t indicate to defects in material and its processing. So, it can be concluded that working conditions in the boiler mainly overheating temperature caused damage of pipe. A promising direction in the development of solid oxide fuel cells (SOFCs) is the reversible approach in which the device operates as fuel cell, producing electricity and heat, and as electrolyzer producing the hydrogen fuel. Reversibility strongly increases the device efficiency. It is very convenient for coupling with Renewable Energy Sources and for off grid applications. Although being very important, this direction of SOFC development still needs serious research efforts for the increase of durability, performances and efficiency and decrease of the switching time. A definitive breakthrough is the separation of the water production/consumption from the two electrodes. This work presents systematic studies on a new design of SOFC with a separate compartment for water formation in fuel cell mode and water injection in electrolyzer mode, named monolithic dual membrane fuel cell. It is based on the discovered property of some proton conducting ceramics to behave as mixed ionic conductors. The first tests of laboratory cells show promising performance with excellent reversibility which opens a pathway for further developments on higher technology readiness level. As a result of sintering the powder workpieces large part of the separated free energy leads to higher density of sintered body. This in turn is accompanied by a change in linear dimensions of workpieces. These linear changes in addition to the alloying elements in iron matrices largely depend on the technological parameters of the sintering process – temperature, duration, protective atmosphere and others. 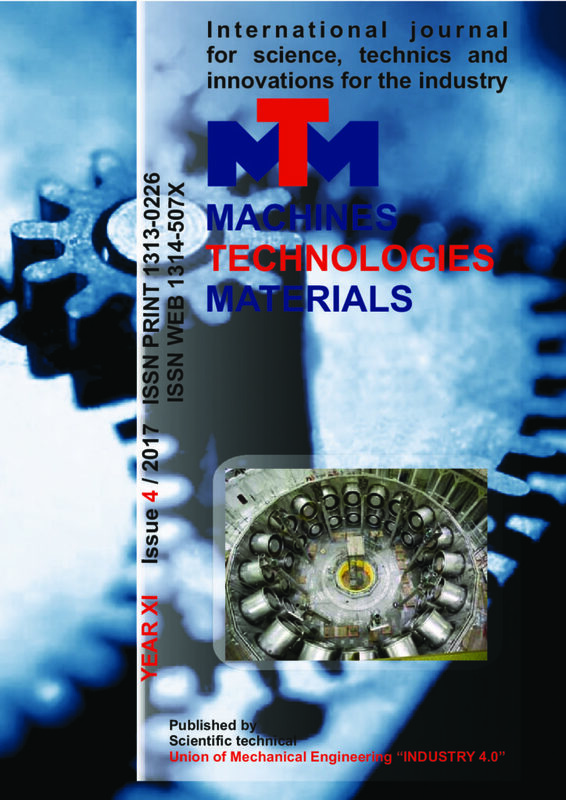 This study monitored the impact of the type of protective atmosphere and duration of sintering on the size change of powder workpieces of iron powder ASC 100.29 alloyed 0,15 ÷ 0,60% P. Sintering is conducted at 1150ºC a duration of 15 ÷ 90min in two protective environments – endothermic gas and dissociated ammonia. Presented are graphical relationships of the relative change in the diametric dimensions of the workpieces in dependence on the concentration of phosphorus in them, the type of the protective atmosphere and the duration of sintering. The purpose of the present paper is to evaluate the geometric accuracy and surface roughness of polymeric samples manufactured by Digital Light Projection (DLP) Stereolithography. The standard cubic samples with dimensions 5 mm х 5 mm х 5 mm were printed of two polymers: NextDent C+B (white-yellowish color A3.5, VITA shade guide) and NextDent Cast (dark-red color), in two ways of placement to the base – horizontally and inclined at 45о. The samples were printed with two different layer’s thickness – 35 μm and 50μm. It was established that the samples of both polymers, manufactured in horizontal position with the lower layer’s thickness (35μm) possess highest dimensional accuracy and lowest interval of deviation. The most accurate are the dimesons parallel to the basis, while these, parallel or inclined to the print direction, have the highest deviations. The interval of the deviations of the dimensions of samples, manufactured inclined at 45o, is nearly 2-3 times higher, as the interval of the samples, made of NextDent Cast, is more than 50% higher than that of NextDent C+B. The horizontally printed samples have 1.5-2 times lower surface roughness compared to the samples, printed inclined at 45o. The surface roughness of the samples, made of NextDent Cast, is 30-50% higher than that of NextDent C+B independently of the layer’s thickness. The increase of the thickness from 35 μm to 50μm leads to 1.5-2 times higher surface roughness in the two samples’ positions. The optical properties of both polymers in the research strongly influence the geometric characteristics, dimensional accuracy and surface roughness of the objects, manufactured by DLP stereolithography.